Hangnails are really irritating and sometimes painful nail condition that creates problem with everything you touch. The condition mainly occurs when the skin around your nails become oil deprived. Basically dead skin flakes, hangnails are caused by nail biting, lack of moisturizing and too much exposure to water. So, by now you would want to know if hangnails cause any serious problems- Do not worry. Hangnails pose no threat, if you take proper care at the right time and ward off the possibility of infection. Here are a few home remedies that will help you fight hangnail problems. Dryness around the finger nails mainly cause hangnails. If you expose your hands too much to water by washing dishes, or dipping your hands in water for long, you might have this annoying nail condition. The best option to treat it is by moisturizing your hand.You can soak your fingertips in a bowl of warm water mixed with bath or olive oil. Clean your fingers with a towel and clip the hangnails carefully. Apply any hand lotion or cream to your cuticles and leave it for some time. This will moisturize your fingers and avert hangnails. Oatmeal is a rich source of natural fat, polysaccharides and vitamins and thus helps in moisturizing and healing the skin. Grind one cup of oats and put it in a bowl. Rub the powder between your palms and on the back of your hands, especially in the cuticle area. This will help remove the dead skin from your hand. Wash your hands after some time and then apply some moisturizer. Almond has the wonderful property of maintaining the moisture balance of the skin and preventing inflammation. Applying almond hand mask is a great option to treat hangnails.Grind a few almonds and mix it with rosewater or milk. You can also use almond oil for this purpose. To this mixture, add egg yolk and apply this paste on to the nail area. Keep it overnight and wash it off the next morning. Skin-healing oils such as lavender, chamomile, neem, basil and avocado when mixed with olive or almond oil becomes a great medicine for healing hangnails. You can also add the contents of Vitamin E capsule to the mixture and gently warm it. Apply it on the hangnail area, massage lightly and leave it overnight. Wash your hands the next day morning. This warm oil massage when continued for a few days wards off hangnail problems. One of the most common remedies for hangnails is soaking the hands in salt water solution. Mix one tablespoon of Epsom salt to one cup of water and make a solution. Salt solution acts as an antibacterial agent and heals the hangnails, especially if there is any infection. One important thing to consider is that you should never bite or pull out hangnails.This will tear the tissues and lead to infection, which will only aggravate the problem. 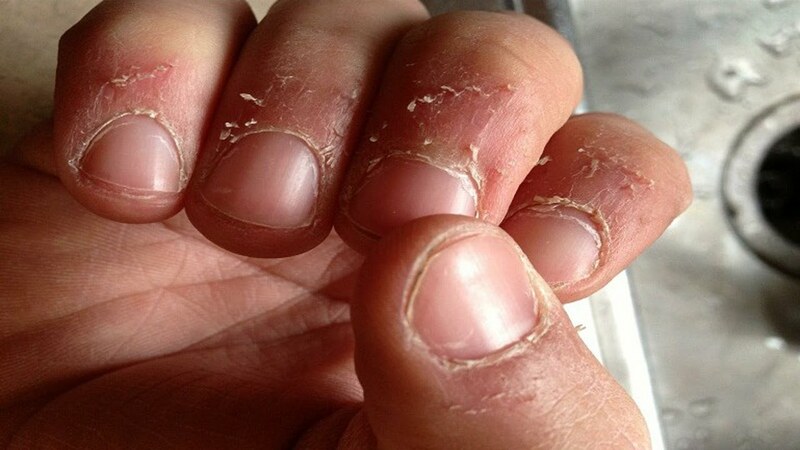 If you are prone to hangnail conditions frequently, wear rubber gloves which have cotton lining to prevent your fingers from too much exposure to water, leading to this awful skin condition.